Discussion in 'Unidentified 1900 to 1979' started by Akoya, Jun 30, 2018. If this is the case, he will probably never be identified. Am I right? He has already been buried in the Berks County Potters Field. If he was "in the bann" his Amish community will not go to law enforcement to identify him. They won't even speak his name. 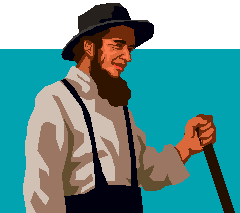 Some of the clothing that was found in the cave was not Amish clothing ("dungarees with a belt"), although his sketch appearance was still Amish. There was obviously not a plan for this shunned man to return to his community group. He was not planning to go home and he withheld his identity. The cave where this man died is located in Albany Twp., just a few miles from Northkill in Bern Twp, Berks County. This was the location where the original Amish bishops and settlers arrived from Switzerland in 1740. A branch of my family tree where part of these settlers. 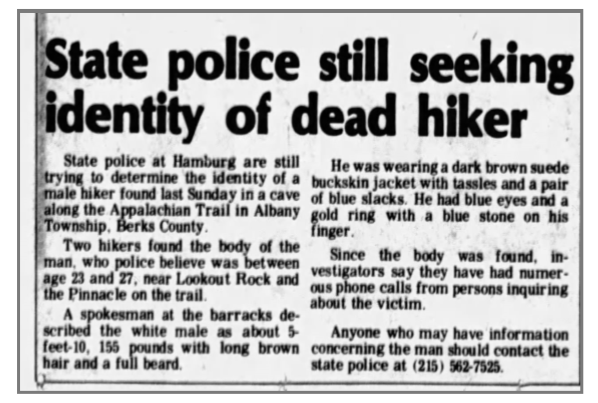 The frozen body of the victim was found by two hikers in a cave below an area called The Pinnacle along the Appalachian Trail, in Albany Township, Pennsylvania on January 16, 1977. The cave where he was found is only accessible by foot. There is little documentation available for this unidentified man. Any photos, autopsy reports, possible fingerprints or dental records have been lost. 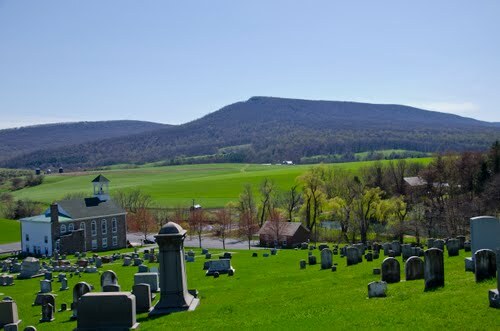 He was buried in the Berks County Potters Field, however, there are no burial plot records available and his exact location in the cemetery is unknown at this time. The investigation found that this Amish man committed suicide. 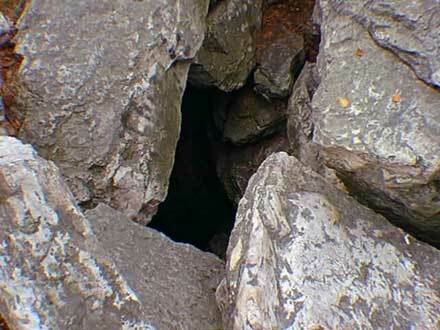 During the cold month of January, he went to a cave, only accessible by foot, and took a drug overdose. It is very likely that this man was being shunned or he was "in the bann". Shunning presents a serious social problem for a married Amish man. Close friends, family members, and an ex-member’s parents must participate in shunning. Most excommunicated Amish people are left to fend for themselves. Excommunication and shunning are decided by a vote of the Amish congregation to remove a member who has violated community rules. 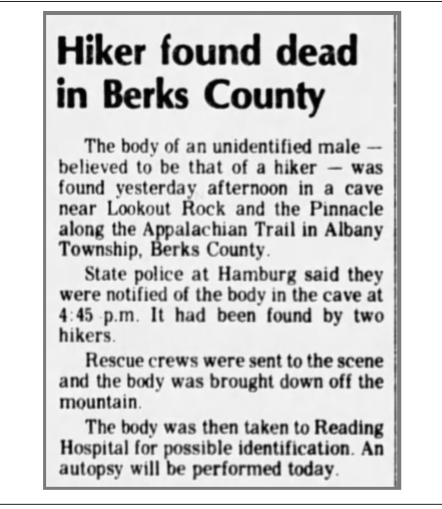 This is probably the reason why the man in the sketch chose to commit suicide in a cold, Berks County cave. It is probably the reason why members of his congregations did not claim his remains. Excommunication from Amish society is a brutal process. Wow, Akoya. I think you are 100% correct. He very likely probably was Amish, that is a very important clue indeed. I wonder if the authorities have pursued this angle? I have no doubt that law enforcement in Berks County pursued this. They would have identified this man as Amish. The Amish have limited records. They aren't part of Social Security or other government programs that require identification. They don't have licenses because they don't drive cars. Most Amish only attend school until the 8th grade. Health care usually takes place within community clinics. There are minimal records for Amish families, with the exception of detailed genealogy records. There is very little for law enforcement to investigate. The Amish take care of themselves and their communities. 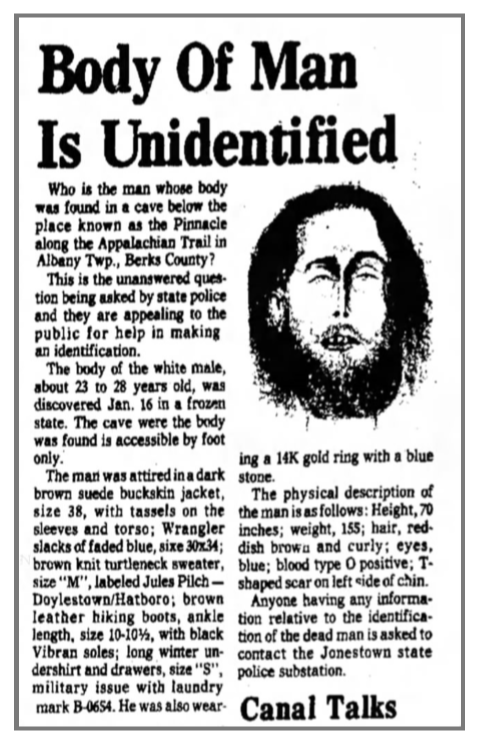 I have no doubt the Amish community in Berks County knew exactly who this man was when he was found frozen in the cave. However, the Amish will not identify a man who is "in the bann". This man no longer exists to the Amish community. They will not even speak his name. He may have gone to the Pinnacle cave because he had no other place to go. The item of his that would make me think he wasn't "Amish" is the "Ring" 14K w/Blue stone. The "Amish" would find an item like this too materialistic. The ring and other clothing items could have been acquired at any point after being shunned. The clothing and ring could have been acquired at a Thrift Store. His excommunication could have been any period of time prior to his arrival at Pinnacle cave. The ring could represent a relationship outside of the Amish community for which he would have been shunned. Mel70, if you don't think he was Amish and if you think the police artist's sketch is terrible, we will agree with you. I have nothing more to say. spike and Scorpio like this.
. And it hasn't let up since. And I said it respectfully also. Mel70, you were never "ganged up on". Two 40 year old artist sketches that you attacked were vehemently defended. One sketch was made by a Pennsylvania State Police artist. You don't say anything to anyone else. And I said it respectfully. And said "I couldn't tell from it". I don't understand why you have the attitude with me. Alrighty folks, lets have a beer or two (or if ya don't drink, a virgin bloody mary or two) and relaaaaaaax lol! CW is the No-Drama zone! Haha Love y'all! KareBear and SheWhoMustNotBeNamed like this. Love ya too Jason. Pfffft!!!! LOL. I will comment on this newspaper article in advance of an onslaught. This article describes "long underware", size S as military issue. There was a laundry mark B-0654. These items were likely purchased in a Thrift Store or Army/Navy store when his Amish clothing was no longer needed. If the Amish looking man from the cave had been a member of the military, he would have had a set of full fingerprints on file with the military. Those fingerprints would have been compared to the prints taken from the deceased. Since this man has not been identified, I do believe we can assume that he never gave fingerprints to the military. Amish men are excused from military service for religious reasons. I will also comment on the man's beard. It is unlikely that the deceased was a local Old Order Mennonite. It is more likely that he was local Old Order Amish. Amish men do not trim their beards and Amish women do not cut their hair. Old Order Mennonite men usually don't wear beards or they wear a trimmed beard. 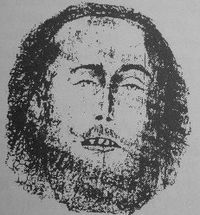 In the sketch by the Pennsylvania Police artist, it appears that the beard was Amish style without a moustache. The Amish generally have a lack of identification which creates a difficult task for law enforcement. Some Amish do have Social Security cards if they work for businesses other than themselves. Many Amish do pay into the Social Security system, but they do not accept Social Security benefits. The Amish community cares for their own elderly. If an Amish individual requires hospitalization, the bill will be paid in cash from special accounts within the Amish community. The Amish do pay taxes at local, state, and federal levels. The Amish build and maintain their own schools. The Pennsylvania Department of Transportation offers ID cards for those with religious objections to being photographed, including the Amish and certain Mennonite groups. There are currently problems for the Amish regarding photo identification to purchase hunting rifles and ammunition in several states. Some states like Illinois do require the Amish to be photographed for a firearms license. The Amish may not use a gun against another human, but they do hunt for food. It is likely that Berks County John Doe never had a photograph identification. 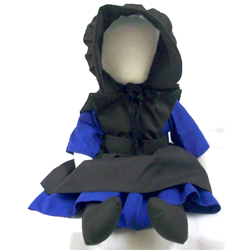 Even Amish dolls don't have faces. 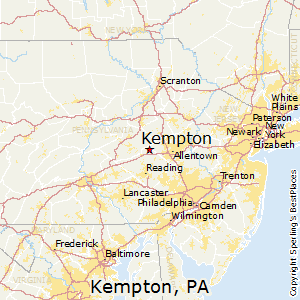 The Pinnacle Cave is located in Kempton, Albany Twp. Fingerprints are on file for Berks County John Doe. We have to assume that there was no match in the military data bases. 1977 was shortly after the end of the Viet Nam era. Unless there was a special exemption, males in his age group would have been drafted into military service or on file for the military draft. If an "Amish" Man was "Drafted" are they still excused from Service?. Amish males are exempt from registering for the draft, based on religious convictions. They can't be drafted.